Dr. Julie Loisel will lead project funded by NSF’s MacroSystems Biology program. 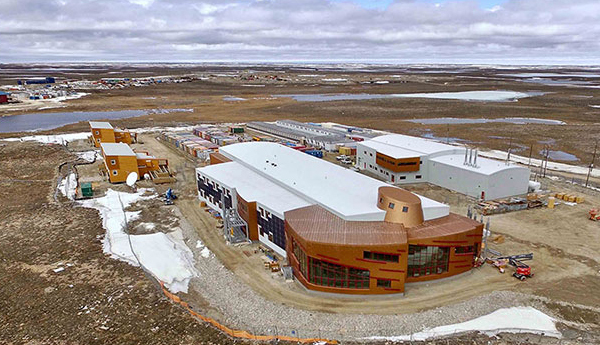 The new Canadian High Arctic Research Station (CHARS) in Cambridge Bay, Nunavut. Photo courtesy of CHARS. Lying quietly at the top of the world, the Arctic tundra’s ancient frozen soils store enormous amounts of carbon. These uniquely important landscapes have thick, peat soil horizons and are vulnerable to warming temperatures. The National Science Foundation (NSF) recently funded a new research project examining these systems and whether expanding peatlands may provide a "sink" for some of the carbon lost as permafrost thaws, and Texas A&M University Department of Geography Assistant Professor Dr. Julie Loisel will lead a team from Texas A&M conducting a portion of the research in far northern Canada. Titled “Peat expansion in Arctic tundra: Pattern, process, and the implication for the carbon cycle,” the project’s additional teams will be led by: Dr. Zicheng Yu, Lehigh University; Dr. Philip Camill, Bowdoin College; Dr. Steve Frolking, University New Hampshire; and Qianlai Zhuang, Purdue University. The Texas A&M team will be based at the new Canadian High Arctic Research Station (CHARS) in Cambridge Bay, Nunavut. “Our main goal is to gather meteorological, ecological and paleoecological data to look into the relationships between air and soil temperatures vs. rates of carbon sequestration in soils from the eastern half of Victoria Island and the Bathurst Inlet region,” Loisel said. The Texas A&M research team studying Arctic soils will gather meteorological, ecological and paleoecological data in Cambridge Bay, Nunavut. The research has major implications: if shallow peatlands are widespread throughout the Arctic, the overall net carbon storage capacity of tundra might be underestimated globally. This research will assess those implications for global climate models. It will also be addressing one of NSF's "Ten Big Ideas for Future NSF Investments," — navigating the new Arctic. This project is one of nine efforts in which NSF recently invested a total of $9 million, all researching biosphere processes and their complex interactions with climate, land use and invasive species at regional to continental scales. The awards are funded through NSF’s MacroSystems Biology and Early NEON (National Ecological Observatory Network) Science programs. “These projects leverage NSF investments in biological infrastructure to study how organisms and ecosystems respond to environmental changes from local to continental scales,” said Joanne Tornow, NSF acting assistant director for biological sciences. MacroSystems Biology is an approach that works to identify the scales of biological processes and patterns and their cross-scale interactions in non-linear, surprising ways. The new research awards will explore ecological interactions that operate across spatial and temporal scales. Findings from environmental, biological and ecological research can be incomplete if interacting scales are not considered. Research in the MacroSystems Biology program explores interactions that operate across spatial and temporal scales. Findings from environmental biological and ecological research can be uncertain if measured on the wrong scales (e.g., studies of local effects that ignore impact of changing global processes). To learn more, read the full arctic project description, and about the other eight new awards recently awarded by the NSF MacroSystems and NEON programs.